Nature Tales is moving to a new server over the next couple of weeks. What does this mean to you? I will be able to provide a more personal interaction and better consistency in delivery. I will be offering free courses in the near future that will enhance your business building and photography skills. What do you need to do? You will receive a confirmation email on Wednesday, April 2nd. Simply click on the link to confirm you want to continue to receive Nature Tales and all of the bonuses included. Throughout history there have been thousands (perhaps millions) of images of flowers created or recorded by artists, scientists and others who find them beautiful. They are also a beloved subject of many photographers who like capturing their vivid colors, remarkable shape and even the way light interacts with their petals and leaves. Though motionless subjects, they are nonetheless among some of the trickiest to record accurately. This is due to a number of issues including lighting, automatic camera settings, and the remarkable range of colors that appear in the world of flowers. One good example is the problem of color saturation. Many cameras are unable to distinguish between the enormous range of hues and shadings that appear in most flowers. Additionally, neighboring blooms may cast an inaccurate color back towards other flowers or plants, and this too can be improperly recorded by a camera. This picture was enhanced using photo editing software to bring out the colors. 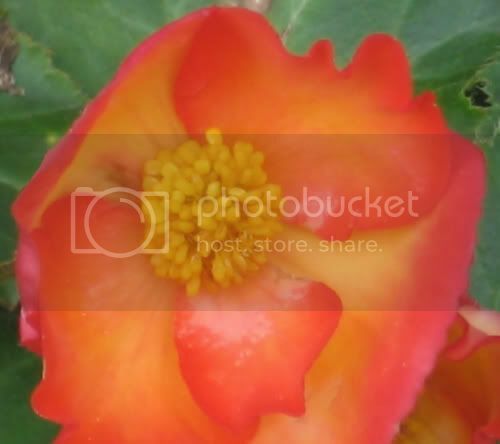 Consider that a pale apricot colored begonia will have varying shades of peach, pink, cream, yellow, green and even red that must all be detected, captured and presented in the photograph. Some cameras have difficulty in this amount of color variation and might display such a bloom or plant in only a limited range of color variants instead. Many ask if there is anything that can be done about this – apart from tinkering with the photographic file in a program such as Photoshop. The answer is “yes”, because color saturation issues can actually be controlled, or at least adjusted, through the use of lighting and camera settings. There are no subjects that photograph well under the brilliant and somewhat harsh lighting of the midday sun, and flowers are no exception. Their tiny details, including veins of color and soft shading can often be lost to the brightness of sunlight. Most avid flower photographers tend to use a polarizing filter to eliminate reflections of color that may allow a bloom to appear nearly colorless. Other photographers might wait for an overcast or cloudy day to photograph brilliantly colored blooms because such limited light can actually give a great deal more control over the end results. Take the many red, orange, pink and yellow colours of a flower and turn them into classy black and white photos. You’ll find when doing black and white flower photography; you’ll have the richness of the flower disappear into a tone of grayscale that demands a higher contrast and definition. You may have to alter your contrast or brightness in Photoshop to add some depth to your black and white flower photography. Alternately many a clever photographer employs something known as “backlighting” in their flower photography. This requires the photographer to either stand with the sun directly behind them, or directly in front of them. This allows the sun to illuminate the flowers in a far more photographically friendly way, but without any concerns about fading or blurring their colors. I've added three new articles since we last met. Whether you are looking for inspiration to create a successful business, bring life back into your current business or simply looking for a lift in your spirits I think you will find it here. Opening To your Creativity, Get Out of That Box Are you limiting your own creativity by the labels you have accepted? Don't be afraid to step out of that box. Remember, the boxes that surround you are only as confining as you allow them to be. Does Happiness Need A Reason? Have you ever wondered what it is that makes people happy? Marci Shimoff asked that question and the result is her best selling book, "Happy For No Reason". Read what I have to say about happiness and her book. Building Your Success Team With Angels of Inspiration Every successful business needs a good team behind them. Finding that team may be easier than you think. Next week we have lined up another week of winning speakers. EVENT: Daniel J. Benor, M.D. Jo Dunning is a most amazing and inspiring individual with profound gifts that assist others in transforming their lives. Caroline Muir is celebrated in the field of Female Wisdom as mother of the modern sacred-feminine movement. Please note that all calls are available by phone or webcast. Webcast is completely free. If you call then long distance charges may apply. You must register to attend. Visit World Changing Wisdom to attend. Don't forget to pick up your fantastic bonus package you will receive as soon as you register.